We write to invite you to a December 6 forum in New York City on the recent experiences of the European left, and their implications for our movements in the United States. Donald Trump's election has not only emboldened racists and the far right in our country, it has been celebrated by right wing forces across Europe. Greece's neo-fascist Golden Dawn welcomed Trump's success as a victory against "illegal immigration" and for "ethnicallly clean" states. Nigel Farage, leader of Britain's racist and ultra-nationalist UK Independence Party (UKIP) spoke at a Trump campaign rally in Mississippi in August, and last weekend came to the United States for a Trump visit to discuss "freedom and winning." Trump's victory was greeted with enthusiasm by the leader of Austria's far-right Freedom Party, and by the well known Dutch Islamophobe Geert Wilders; the leader of France's right wing National Front, Marine Le Pen, declared that Trump's win was a "sign of hope," and though he didn't explicitly endorse Trump, Vladimir Putin, who supports Le Pen as well as Syrian President Assad, was clearly more than pleased with the outcome of the election. Common international struggle against both the far right and the establishments whose policies have fostered it is an obvious imperative. 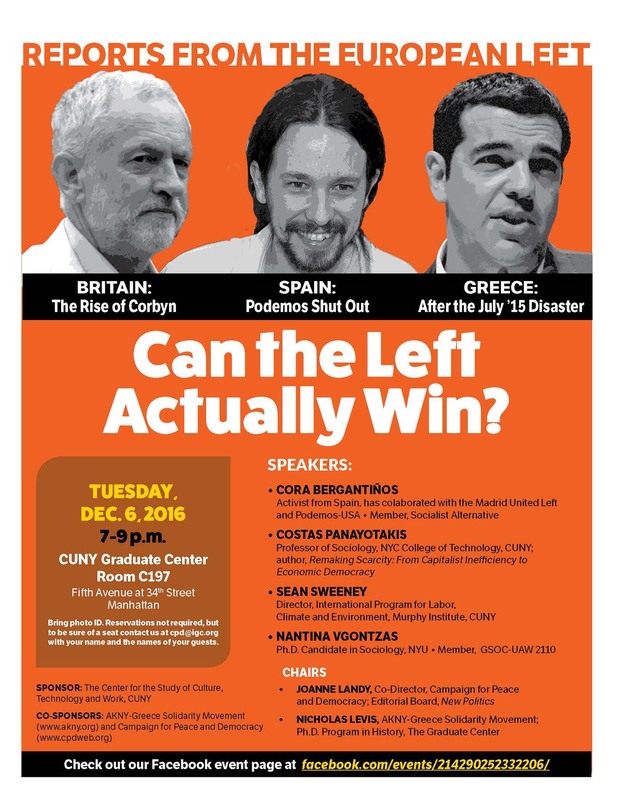 The December 6th forum, which is sponsored by The Center for the Study of Culture, Technology and Work at CUNY, and co-sponsored by AKNY-Greece Solidarity Movement and the Campaign for Peace and Democracy, will analyze and evaluate strategies by left movements in three European countries: Syriza in Greece, Podemos in Spain, and the British Labor Party opposition (now leadership) led by Jeremy Corbyn. We plan to videotape and livestream the proceedings, but we hope you can join us in person in New York.